Description of "Why HE Suicide?" A girl Nancy finds a man senseless on road near a river-bridge, blood was coming from his mouth and then she admits him into a hospital where doctors finds a deadly poison in his body. Now he is in hospital struggling for his life and Nancy is trying to find reason behind his suicide. This novel is based on true inter-caste love story, so this is not only fiction, but except that its characters, scenes, and situations resembles to reality in India, because India’s suicide rate per 100,000 people compared to other countries. More than 187,000 people suicide in India every year, and most dominant reason is love affairs, marriage related issues, and non settlement of marriage. This is normal in India because here in our society love is accepted, but not love marriage. We are allowed to have many affairs, but condition is that parents would arrange marriage of their children at last. So due to this reason many couples or one of them commits suicide because they do not want to marry another except their love partner. But if any couple marries secretly; they brutally kills by their parents or relative due their marriage against rules of caste or religion. A Creative Author writing about contemporary problems. follow Ashish K Singh on Twitter @authorashishks like on facebook.com/authorashishks or mail at authorashishks@gmail.com, your feedback is much appreciated. 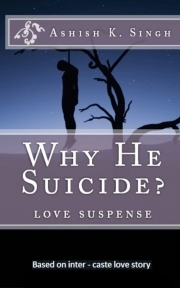 Reviews of "Why HE Suicide?"